The Horton Eco-home design project began in the direction of using pre-cast concrete half cylinders to build an earth house inspired by The Lord of the Rings! The client’s commitment to sustainability and efficiency, without compromising on quality of space, gave us a rich canvas to exercise architecture and the creation of a home. Early design development, detailed site analysis, and comprehensive cost studies eliminated the use of concrete as a potential building material, and led to a more conventional building technology. The design for the residence evolved from a concept of repetitious geometry frozen in the land to form a dynamic and changing space. This was seen as an extension of the site conditions, a house that would capture the various qualities of natural light at different times of the day, week, month, and year. The house is oriented ten degrees east of true north, and has a large curved thermal mass wall to the south, buried 1.5m into the sloping ground. The wall offers protection from the ground frosts and improves the geothermal contact with the constant sub-surface temperatures found below the natural ground. 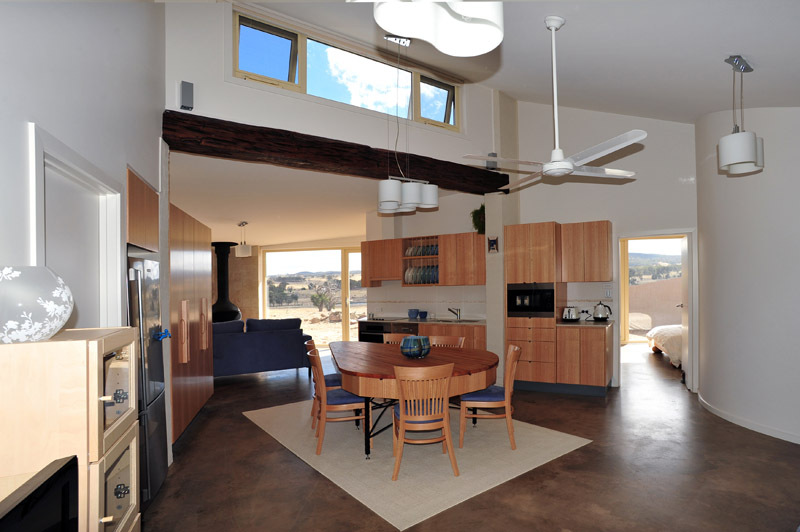 The main skillion roof taking off to the north brings a different quality of light to the southern parts of the envelope, including direct natural illumination on the curved thermal mass wall during the colder months. 18 panel 3.03kW solar system with a 49.2kWh battery storage. There are 54,000 litres of rainwater storage available through roof collection, and an in-ground septic system for black water. The site is approached from the south where the roof of the house evokes a bird taking flight. Coming from the south-west, past the infrastructure to the north, the house reveals itself like a home from a modern fairytale. Prepare to be greeted by the welcoming round door, just as in the epic fantasy.